Question for the Tarot: What does the heart want for New Moon? 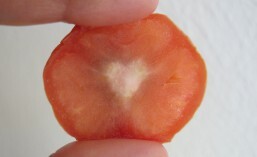 Summary: The heart wants to uncover a monetary treasure, in order to gather resources and energy for planting new seeds. Good luck is flowing, and the outcome does lead to furthering one’s potential on an authentic path. Interpretation: To be sure, the heart is looking for a monetary treasure. The heart is typically not a materialistic voice within the psyche, but in its wisdom, it could wish to recall resources that have run their course in another direction, and invest anew. Where can one “cash out” of an investment of time, energy and resources, especially one that causes scattering or draining? 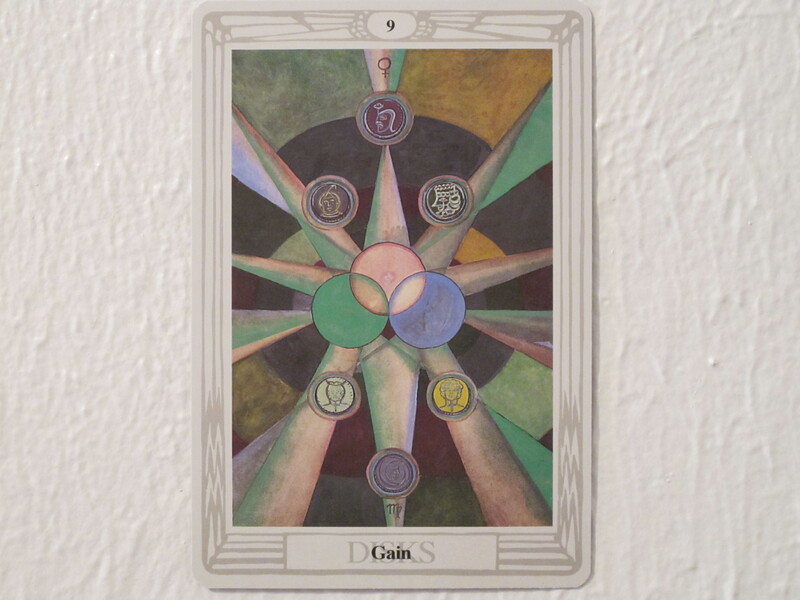 The 9 of Disks shows nine disks with attractive facial portraits of the planets’ gods on them. This resembles how modern day coins have the faces/profiles of successful and notorious persons on them. These disks are “making an attractive offer.” The disks are orbiting around three transparently colored disks which overlap, representing another alignment – that of love (pink disk), creativity (green disk), and wisdom (blue disk). Thirdly, this card’s own astrological planet of Venus (love and beauty) sits well in Virgo (wholistic health, practicality, and appropriate organization). Through these layers of alignment, this card speaks of practical treasure occurring as a stroke of good luck. The treasure is close at hand — in fact, it is in the backyard. How to find this good luck? With the spread’s next card, the Tarot sets up a treasure map. The image of the 4 of Disks shows a four-tower castle with very definite walls surrounded by a moat, with one sturdy bridge built across the moat, one other door visible in the castle that does not have a moat crossing, and three roads built from the land side to the moat, with no crossings there. In its map of a single-entrance castle, the Tarot speaks of persistent, focused effort in a fruitful direction (Capricorn). The strategy for entering from the exterior is simple — cross the long bridge over the moat with enough fortification to reach the interior. The focus is on the crossing and no more. Many treasure hunts are this way; step by step from clue to clue. Therefore, to claim the treasure in the backyard, one just needs to be decisive and tenacious. 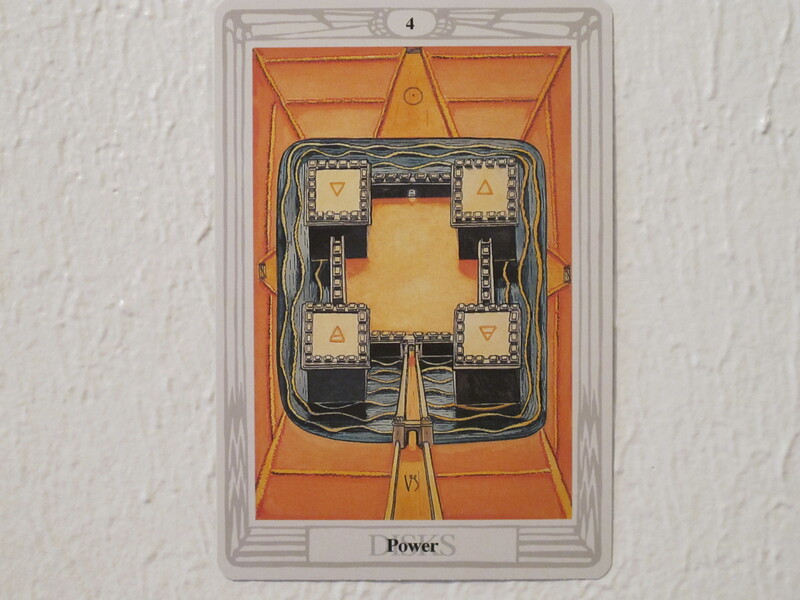 With the third card, the Tarot indicates that the heart is indeed working on walking an authentic path, and that it would be more centered and focused in that intention after regrouping resources. The vision of oneself on the horizon is the IX of Trumps. 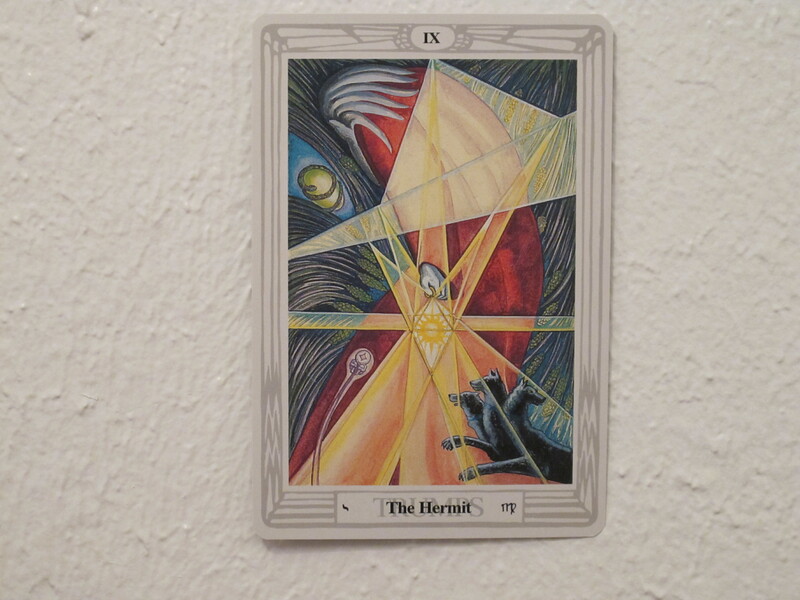 In this card, a Hermit travels his own path, guided by the light of an inner lantern. To expand on the nature of this Hermetic path, the image presents fertility and inner world symbols (an Orphic egg, a sperm, grain, and Cerberus, the three-headed dog). These show that energy on this path will be used to develop “night vision” and “reproductive virility,” either practically or symbolically. Since mainstream culture does not institutionalize the development of those qualities, they need deliberate planning and funding. The resources for these are ready to be summoned for New Moon. This entry was posted in astrology, charlottesville, entertainment, new moon, ritual, spirituality, tarot, workshops and tagged astrology, charlottesville, entertainment, new moon, ritual, spirituality, Thoth Tarot, workshops. Bookmark the permalink.